Last month the City of Sydney implemented a scheme with the potential to deliver multiple positive social and environmental outcomes. 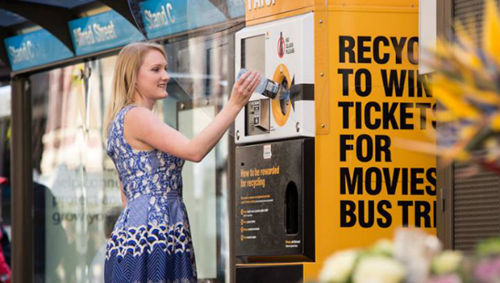 Two new recycling machines capable of holding 2,000 empty deposited plastic bottles or cans are now available for use, and in return the user will be rewarded with a small donation to charity, a 2-for-1 food voucher from a local food truck, or entry in a draw to win two tickets to the 2014 Sydney New Year’s Eve Dawes Point event. When the reverse vending machines are at capacity, they automatically send an email to council informing them that they are full. As Australia’s inner city populations continue to increase, so too does the amount of waste; particularly littered waste. It is a fact that a ‘cash for container’ scheme will reduce litter and increase recycling rates to 80 to 95 per cent. South Australia is leading the way with such a scheme and has double the rate of recycling than the rest of the country. The city has tried using recycling bins in public areas, but levels of contamination made it impossible to recycle the materials collected. The beauty of these machines is that they only accept items that can be recycled and reject anything else. Will The Scheme Really Work? Although in its infancy, the scheme could really achieve some important social and environmental goals, and not just harbourside. The potential for all citizens, including the homeless, to benefit by using the recycling machine, the potential for a better environmental outcome, and the potential to increase charitable donations makes the scheme a goer on many levels. The idea will invariably need some fine-tuning, but I would think it will eventually spread to other cities across the nation, including little old Melbourne.